Bone broth is getting a fruity, and nutritious, new look. After a few years on the scene, trendy bone broth has taken on a bold, new look. It’s evolved from a clear, stand-alone soup to an ingredient that's being added into many broth enthusiasts’ daily smoothie routines. Yup, you heard that right: Bone broth smoothies — or "brothies" — are officially a thing. And they're not exactly cheap. 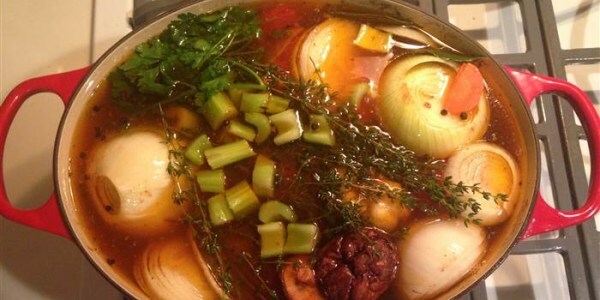 Chef Marco Canora is, to say the least, a broth expert. He is the chef and owner of New York City’s Brodo, which now has four locations. The popular eateries are all totally devoted to broth. He sells it by the cup (in several flavors), uses it in chilled gazpacho soups and, most recently, he's been using it to add a nutritional punch to smoothies. Canora has been making bone broth smoothies at home for years — his wife has one every morning for breakfast and he told TODAY Food that both of his daughters drank plenty as babies. Canora values bone broth for its amino acids (it contains glutamine, glycine, arginine and proline) that help maintain healthy cells. “All bone broth, made properly, has good collagen protein,” Carona told TODAY Food. “Collagen is the protein that holds our bodies together — the elasticity in our skin and the strength in our nails, joints and ligaments." Caitlin VanDreason, a registered dietitian and clinical nutrition manager at Harvard-affiliated Cambridge Health Alliance, supports that bone broth is a "fairly good source of protein" with approximately 6 to 12 grams per cup. However, there is currently no medical evidence that the collagen-producing amino acid structures, like those found in bone broth, actually replenish the collagen in our skin or strengthen our bones. While bone broth might not be a magical anti-wrinkle elixir, that doesn't mean bone broth smoothies aren't good for you. "There are many benefits to having soup, in general," Bonnie Taub-Dix, a registered dietitian and creator of Better Than Dieting told TODAY Food. "Soup [that is low in sodium and clear broth based] can help act as a speed bump to a meal, helping you to eat less and feel more satisfied. And, particularly when the soup contains a medley of vegetables, it enables us to get a bounty of nutrients, that we might otherwise not take the time to prepare." So, tempted to try out this nutrient-rich "speed bump," I decided to make some brothies at home. The results were pleasantly surprising — it just really came down to nailing the recipe to my own (and my kids') taste buds. So how does a bone broth smoothie really taste? To find out, I put two of Brodo’s signature recipes to the test to see how chicken bone broth affected the flavor profile of different drinks with unique ingredients. Just as Canora said, the extra fruits and veggies masked the somewhat pungent, meaty broth taste, leaving only a slightly salty flavor that was well balanced with the other ingredients. As a base, I used a store-bought broth from Epic, which is made in Austin, Texas, and ships to consumers in 14-ounce glass jars. Like many busy moms, I don’t always have the time to make my own broth at home, but if you prefer to do that, it’s easy to chill and freeze for later. Canora uses chilled broth he makes from scratch in all of his smoothie recipes. Was it love at first sip? 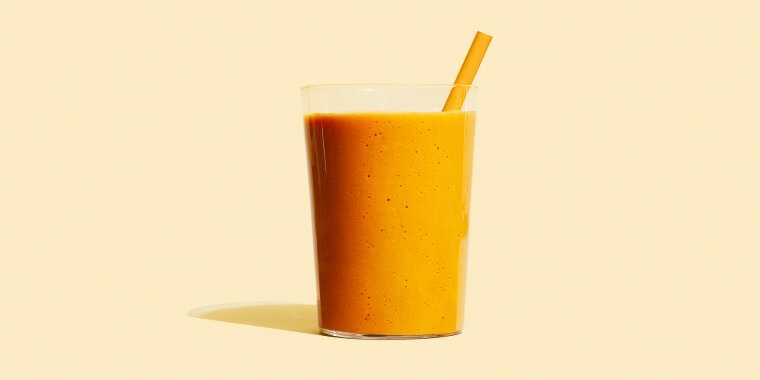 The first brothie I tried to recreate was Brodo's Everything Orange smoothie ... and it was delicious! The salty undertones balanced out wonderfully with the spicy ginger juice (I grated fresh ginger right into the blender) and the sweetness of the mangoes and citrus were awesome. It was nourishing, filling and tasted very fresh, plus it contains turmeric, a root that has been used in Ayurvedic medicine in South Asia for centuries — and the current star of another trendy beverage: golden milk. I also gave it to my 1-year-old, who absolutely loved it, too. So this bright-tasting smoothie definitely garnered bonus points for passing the kid-friendly taste test. Test drive: Is bone broth the new green juice? One 16-ounce serving of the Everything Orange bone broth smoothie has 11 grams of protein and 19 grams of sugar. But it also meets 39 percent of the daily recommended amount of fiber, a whopping 215 percent of your daily vitamin A needs and over 100 percent of your vitamin C needs. This makes it a healthier option in comparison to other orange smoothies on the market, like a 16-ounce serving of Jamba Juice's Orange Dream Machine, which has 8 grams of protein, a whopping 71 grams of sugar and no fiber. Next up, I tried Brodo's Deep Purple smoothie. In color, this beverage certainly lives up to its name as it has a beautifully vibrant hue akin to an eggplant. This drink had an enjoyable flavor profile but if you're not a big beet lover, this mix definitely isn't for you. The earthy sweetness of the root vegetable was a bit overpowering, so much so that the broth flavor was completely masked yet again. 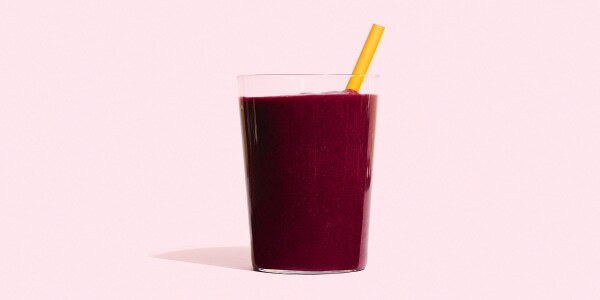 This smoothie also contains blueberries (which, in their wild form, have been celebrated for their antioxidant-containing properties) and sweet cherries, which made this brothie taste more like a smoothie. I really liked the coconut in this mix, too, which lended a slightly tropical creaminess to the whole concoction. My recommendation for brothie makers at home? Use half a beet to tone down the root veggie-forward flavor, throw in some of your favorite leafy greens to kick up the nutrient profile and add a few extra berries, like raspberries, for flavor. One 16-ounce serving of the Deep Purple has 12 grams of protein and 19 grams of sugar. It contains half of the fiber you need a day plus 11 percent of your daily recommended vitamin A intake. It also contains 23 percent of your daily recommended folate (an essential vitamin for treating anemia). After trying both brothies and experimenting with the recipes, I knew that these smoothies were definitely something I'd be adding to my family's diet. I love that I can pack in a whole serving of fruits and vegetables in one sitting, and that they contain far less sugar than traditional smoothie drinks made with just fruit or juice. Also, I noticed that I felt fuller for longer and didn't need another snack or meal for several hours following the drink. Brothies, you have my stamp of approval!